How can we rebuild working-class solidarity? 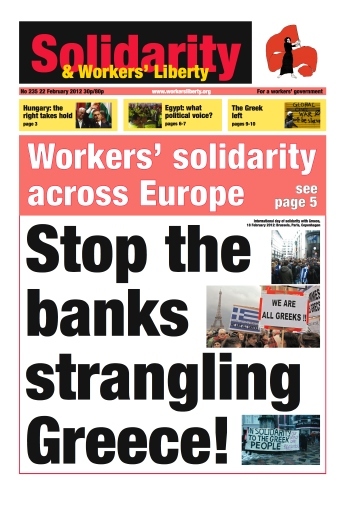 Stop the banks strangling Greece! Mark Simmonds, the Tory MP who will speak at the 29 February “Winning Business in the New NHS” event, and a shadow health minister while in opposition, gets £50,000 a year for ten hours a month “consulting” from Circle, who on 1 February became the first private health care firm to take over an NHS hospital (Hinchingbrooke, in Cambridgeshire). Andrew Lansley, currently Tory health minister, got £21,000 from John Nash, boss of private health firm Care UK, in November 2009, to pay for Lansley’s private office when in opposition. How can we organise to win power in our workplaces and our unions? Come and meet other rank-and-file trade union activists to discuss strategies for fighting back at work – and winning. We’ll be using Labor Notes’ Troublemaker’s Handbook and will be joined by Labor Notes co-founder Kim Moody. This is our first meeting, and we hope to develop an ongoing programme of workshops and training. Anyone interested in worker organising, from any trade union, is welcome to attend. The June 2012 congress of the GMB, Britain’s third biggest union, will debate the union’s political activity and its relationship to the Labour Party after a large number of branches submitted motions on the topic. Teachers across 12 sixth-form colleges in London will take half a day’s strike action on Thursday 23 February. The workers at Brooke House, Christ the King, Coulsden, Havering, Leyton, Newham, Sir George Monoux, City and Islington, St Charles, St Francis Xavier, Woodhouse and John Ruskin will walk out from lunchtime. The strikes are part of a national campaign against cuts to college budgets and attacks on pay and conditions. The strike action, however, is initially limited to London. Workers are occupying a packaging plant in Bootle near Liverpool after bosses locked out employees in the midst of a battle over redundancies. Managers at the Austrian-owned Mayr-Melnhof Packaging plant wanted to axe 37 jobs, prompting a strike by members of the Unite union. Bosses responded by locking the workers out, a step unprecedented in British labour history since the 1950s. Around 40 workers occupied the site at around 11:30am on Saturday 18 February and vowed to stay until management resumes negotiations about the job losses. A union campaign has won reinstatement and the living wage for cleaners employed by Dynamiq working at NTT Communications Ltd. in London. The Industrial Workers of the World Cleaners Branch adds the victory to a growing list of wins against major cleaning contractors in London. Prominent IWW rep and cleaning worker Alberto Durango remains out of work, however, and IWW members, supporters and other trade unionists will demonstrate at 6pm on Thursday 23 February at Heron Tower (near Liverpool Street) to demand Alberto’s reinstatement. Prominent anti-Zionist writer Norman Finkelstein has broken from the “Boycott, Divestment and Sanctions” (BDS) movement, denouncing it as a “cult” and saying that it is based on a politics of “eliminating Israel” but is too dishonest to say so. Current opinion polls in Greece give parties to the left of Pasok (roughly equivalent to Labour) well over 40% of the vote in the new elections due there in April. They show strong feeling against the “memorandum” (the cuts), but dispersed and expressed in often confused and contradictory ways. In the last parliamentary elections, in October 2009, before Greece’s economic crisis exploded, Pasok and New Democracy (roughly equivalent to the Tories) had 77% of the vote. That score has decreased to under 40%. This year marks the 200th year anniversary of the high point of the the “Luddite” revolt (November 1811-February 1813). The Luddite revolt was a quasi-insurrectionary movement of textile workers taking action against their employers by breaking machinery, setting light to factories and other acts of “violence”. The revolt started in Nottinghamshire and spread to the wool districts of Yorkshire and the cotton mills of Lancashire.